Until the mid-20th century, psychedelic mushrooms -- fungi that when eaten produce abnormal psychic effects -- did not arouse international interest. However, for thousands of years they have been an important part of many religious rituals. they were jealously guarded by the Mexican Indians, who believed that God dwelt within the plant; Siberian tribesmen ate them to induce an intoxication accompanied by seemingly superhuman strength. In the 1960s, the flower children of America's counterculture sought spiritual visions through mushroom eating. 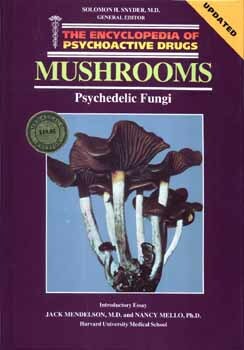 Just how safe are these "magic fungi?" How do their hallucinogenic properties compare with those of LSD? Mushrooms: Psychedelic Fungi takes a look at one of nature's oldest -- and most frequently misunderstood -- drugs. The newly updated Encyclopedia of Psychoactive Drugs, specifically written for young people, provides up-to-date information on a variety of substances that are widely abused in today's society. Each volume is devoted to a specific substance or pattern of abuse and is designed to answer the questions that young readers are likely to ask about drugs. An individualized glossary in each volume defines key words and terms, and newly enlarged and updated appendixes include recent statistical data as well as a special section on AIDS and its relation to drug abuse. The editors of the Encyclopedia of Psychoactive Drugs hope this series will help today's adolescents make intelligent choices as they prepare for maturity in the 21st century.